If you have been here before, things will look quite a bit different from even a few weeks ago. New template, new colors, and a semi-familiar logo. I took the plunge and moved over to a self-hosted site. I’ve needed to for ages, but the thought was overwhelming and confusing. And I was sure I’d screw it up and somehow my site would end up in the ether leading to nowhere. I’d planned on hiring someone to help do everything for me, but with the medical bills coming our way in the next few months, I need to save every dime. Also, I’m a control freak. If I can do it myself, I want to learn how. Heck, six years ago I couldn’t do anything but change a color photo to black & white, and this last year, I designed the new North Star Trilogy covers. I love learning new things, I love a challenge, and art is my drug. So while avoiding real-life issues that made concentrating on writing and editing close to impossible (more on that in another post), I headed to Pinterest for website ideas, and I found a beautiful site that led to this template. Within twenty-four hours, I had everything I needed to take control of my website. I also had a new business name! In the next weeks, anytime life got too overwhelming, I headed to my new websites and worked on getting them up and ready to share with the world. I worked on my press and editing sites first and made the decision early on to combine them. Plus, if I was going mess this up, I wanted to do it where I was gifted a learning curve. My press used to be called Labyrinth Bound Press, which was easily misunderstood as a maze rather than a meditative tool used for greater personal understanding. I’m probably the only person who cared about the distinction. Haha. When I came up with Labyrinth Bound Press, it was years ago, and I pulled it from the very first story I wrote, one many of you have never read. At the time, I didn’t have plans to self-publish more than a few books, and I didn’t consider how easy labyrinth was to misspell. On top of that, the name doesn’t fit me anymore and what I’m hoping to show the world with my writing, especially when the perception most people have is getting lost, chaos . . . and David Bowie. So after a few glasses of wine and a long conversation with myself that this wasn’t the end of the world (I’m not Evernote, confusing half the world with a new logo), I bit the bullet, bought a new domain, and made the decision to rename, rebrand, and redo everything I wasn’t thrilled with. So now I’m Boho Press. 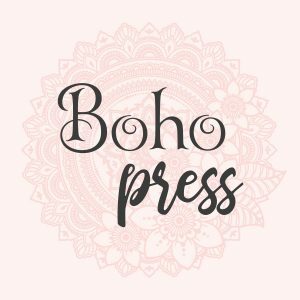 My editing business is hosted on that same website rather than its own site, so anyone looking for Labyrinth Bound Edits, I’ve devoted some space there for the newly named Boho Edits. I’m sure the site will be visited more by my editing clients than anything else, and if you’re curious who those people are, check out my editing portfolio. I’m truly blessed with the authors I get to work with, and you love all of them! As you can see, I embraced pink. I did so on this site as well, going way back in time to use one of my favorite color combos ever: pink and green. On many a bio, I’ve written that I’m a lover of all things green. It’s my favorite color, but pair it with pink and coral, and I’m 😍. My very first logo was designed by a friend using a red-orange, the color of a poppy, also the nickname I’ve used for my kiddo online since I started blogging back in 2002. 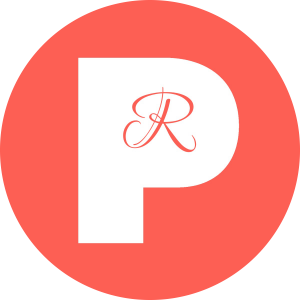 I’ve gone back to that original logo, tempering the red to a coral, and I’ve changed the font used on the R.
For years I’ve used the ⚣ symbol so people would know at a glance that I write MM romance, but that made me feel a bit penned in. I have plans to write a lot of different types of stories, so going back to a logo based on my name rather than my genre feels freeing. I want to write Summer and Russell’s story from North Star, and I’d really love to write some MFM based on characters from Naked Organics. I could start new pen names for each genre, but I’m not sure I have the mental power for managing that. I’m already managing and editing business, writing, and carving out time for family and friends. The simpler I can make my life, the better. My hope is that this will be my landing spot. Now that I have full control over it, I’m going to to take charge. I stopped blogging years ago because there didn’t seem to be a point with other social media dominating. After watching author friends ejected from various social media sites, it became obvious how necessary a website was. I’ve simplified this site, pulling some 50+ categories down to a much more manageable size. I’ll go over various aspects of my site in the coming weeks, including the columns I’ll write, which are on the sidebar over there >>> and on the top of the homepage, right under the bookshelf links. One thing I love is the extra plug-in I was able to buy from the website designer; it’s an amazing shopping tool that helps simplify my life and yours, I hope. All my books at various sites are on one page. So if you love buying from Apple Books, you can go to my Shop page, click the Apple Books button, and see everything I currently have for sale there right now. Today. No more clicking dead links! One-page shopping, which I love. I’ll post via Twitter, Instagram, Pinterest, and Facebook, but if you really want to follow along with regular blog updates, subscribing to the feed below (middle footer section) is the best. If you prefer to only know about sales and new releases, subscribe to my newsletter. And if you prefer ePubs and are sick of waiting for books to get out of KU, subscribe to my super-secret newsletter that gives you early access! And if you’re looking for a website template that works, Phil at Pipdig does amazing things! STOP with the Gay For You, Please!